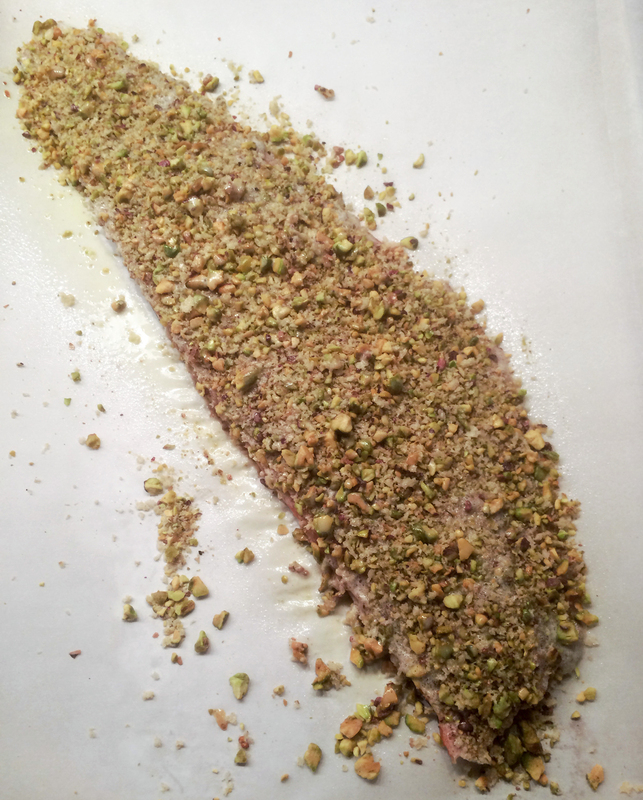 Pistachio Crusted Salmon — Good Food Makes Me Happy! First dinner of Fall and it was quite delicious! Pistachio crusted Sockeye Salmon served with a Summer Squash Goat Cheese Custard and Caesar Salad with baked Chickpea Croutons and a Vegan Cashew Salad Dressing. Quick and easy. Arrange the salmon, skin side down, on parchment paper that has been placed on a baking sheet. In a small bowl mix the lemon juice and mustard. Brush liberally over the salmon. Coarsely grind the pistachios in a food processor. Put in a bowl and add the panko bread crumbs, salt and pepper (to taste). Sprinkle the nut mixture over the salmon to cover evenly. Drizzle salmon with olive oil (or use an olive oil spray like I did). Bake 15-20 minutes. Serves 4.